rsh between Windows 7 and Ubuntu 10 using different user names. A hurdle I’ve encountered is how to get rsh to work between Windows 7 Ultimate and Ubuntu 10.04 LTS. rsh-server coming with Ubuntu 10.04 uses a configuration file pointing to a PAM security module that was missing from the system. The /etc/pam.d/rsh points to the old pam_rhosts_auth.so (which supported the promiscuous option which all tutorials talk about), but my system only has pam_rhosts.so. rsh.exe is not found in Windows 7 anymore, so we have to manage using some other tools to connect. The goal is to be able to invoke commands from the Windows machine (client) to Ubuntu (server) using rsh. First we need to configure the rsh server (linux part), then find a suitable Windows client, then test that is working. This is the most complex part – and a lot of things have to be in order. I had troubles to get it to work because of bad configuration files installed by default and because of lack of verbosity of rsh as well as pam modules. xinetd is required, as it is running the rsh server. Also, from now on, the rsh-server service name is ‘shell’ as you will see below. We need the shell service present there, since that’s what xinetd looks for when a connection arrives on port 514. This file tells to xinetd what to execute when a connection arrives on port 514. The link to the /etc/services above is the service name ‘shell’. 4. Update the security that comes by default with rsh. This instructs pam to reject any logins for user names that are marked as no login, then to use some environment variables which I did not check it (since its working). The third auth line is the most important, it instructs pam module to accept connections based on the /etc/hosts.equiv and username’s ~./rhosts file. For further details, please check the man page of pam_rhosts, it describes the rules exactly. Basically you need both /etc/hosts.equiv and the .rhosts files to allow the access. I have commented out the @include common-account, so that PAM doesn’t check against the users physically having accounts on Ubuntu, since the Windows user that we’ll use (Root) might not have an account there. This brings me to an important point. Debugging. If you don’t understand what happens after all, you can activate strace for rsh, since both rsh and pam are quiet even if there are problems (such as modules not found, etc). This will produce a /tmp/rshd.strace file which is very long, but it helps when … nothing else works. 5. The last part of configuration is setting up the hosts files so that it will allow the Windows user name. For this two files have to be modified to allow pam_rhost module to match the remote user name with the remote ip and also with the local account. A lot of tutorials say that /etc/securetty has to be updated to include rsh (and rlogin). But this is not needed, since the /etc/pam.d/rsh does not mention pam_securetty.so. There are two clients that I was able to get to run on Windows 7, a standalone one (.exe) http://www.ccs.neu.edu/home/bchafy/rsh_vista.html and a perl library Net::Rsh which it can be used with ActivePerl. The first byte of the reply is either 0 (success) or 1 and then it comes an error. IPs can be used instead of host names, but there’s always delays in reply from Ubuntu unless the IP of the client is not added in /etc/hosts with a name (and then all the other files /etc/hosts.equiv and .rhosts are updated accordingly). 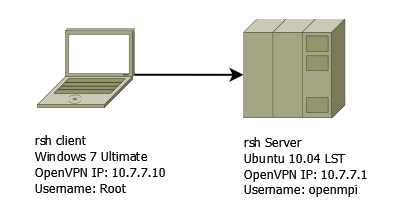 rsh server does host name lookups and it waits for timeout before settling for the IP. Of course, better is if all the nodes within VPN have their own DNS, but … that’s for another article.